Can't attend? Follow NOSHtrekker to know of future events! Dine in esteemed company with Maestro V K Sivakumar. He has performed internationally in solo concerts and accompanied other greats in Indian Classical concerts and Bharatanatyam programmes. Thrilling audiences with his Carnatic flute and vocal, Maestro Sivakumar will perform with student Chris Choo and accompanying artist on Mridingam. This is a rare treat to share an intimate space with great musicians and delicious food to set the mood. 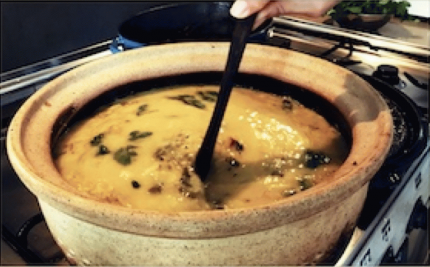 The food is lovingly prepared in claypots to bring depth to 9 authentic vegetarian dishes. Curries simmered to perfection, slow-cooking to release layers of flavor and a variety of vegetables and dhahls to give delightful combinations of wholesome goodness. The number 9 is believed to be auspicious by a number of cultures. Its mythical and mysterious connotations among other reasons also reflect the 9 human emotions that find artistic expression in Indian classical arts. Come enjoy the musical and culinary arts with us on this special night of 18 March. Mr. V K Sivakumar holds a Vadhya Visharadh Diploma in Flute from the Tamil Nadu Government Music College. He had a seven year privilege of learning under Flute maestro Dr.N Ramani and Sri. R Thyagarajan. He is a regular solo concert performer and has given concerts all over India and abroad. He is an accomplished accompanist for classical Bharatanatyam concerts. He has accompanied artistes such as the Dhananjayans and Chitra Visweswaran in their overseas classical concerts in USA, France, Germany and Malaysia. He has participated in the Vadya Vrinda conducted by premier Violinist A. Kanyakumari, and in Bharatanatyam programmes organised by the percussion wizard Shri Karaikudi Mani. He is also a Carnatic vocal teacher. Mr Sivakumar has nearly two decades of teaching experience in both Flute and Carnatic Vocal. Mr.Sivakumar joined SIFAS (Singapore Indian Fine Arts Society as a Carnatic Flute tutor in August 2007. This is an extra-ordinary NOSHtrekker event and not part of this hosts usual experience. It would be helpful to know the guest's name joining in your place.